Transylvania… Hmmm! Transylvania is my childhood cradle. Wherever I am, whatever I do a large part of my soul always will be there, in Transylvania. You’ll say I’m subjective. Maybe… but you’d better read this page before you give a verdict. For foreigners it’s the most known province of Romania. You probably heard about its castles and something from Dracula’s story of Bram Stocker. I think it’s just a little part of what Transylvania really means. Stay with me and you’ll find more. First of all, for those who never heard about this place as well as for the others click next link to find out where is Transylvania. I wrote this page not only to easier locate this province but also to give you some point of view and explain the way I structured the information. Not quite a geographic or a historical structure. If you just pick up a train or a car and cover Transylvania… let’s say from Oradea to Brasov you’ll never get bored. Sceneries parade in front of you one by one and each one tells you to stop there be cause that is the best. And you have to stop. Because nature is not a movie. You can’t watch nature frame by frame. You just need a TV and a comfortable armchair for this. So, go outdoors! Smell the nature. Listen to it. Touch it. Taste it. Do you think I’m kidding? Did you ever smell the forest when it’s raining? Did you ever listen a 5 A.M. nightingale concert? Did your feet touch the grass in a sunshine morning? Did your mouth feel the taste of a wild blueberry? This is the real nature. You can explore it everywhere in Transylvania. And don’t forget to use all your five senses. That’s an advice from a backpacker. And what does a backpacker love the most? A hike on mountains, of course. That’s why I strongly recommend that you don’t miss the Apuseni Mountains. Sweet up hills alternate with steep ridges. Beautiful forests hide caves, swallow holes, dolina and waterfalls. 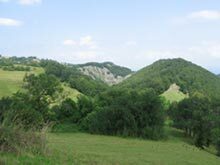 A large part of their surface is included in Natural Park of Apuseni Mountains. Click the link above for more information and hints. Are you afraid of this kind of walk? Don’t be! This mountains are neither very high nor difficult. I met there every kind of people. From family with 3-4 year- old children to 80 year-old seniors. And they all love it. Many of them come back again and again. a place with virgin forests and megalithic rocks. From Transylvania you have access to almost all Romanian mountains. Please check National Parks page for more details. First was Dacians. 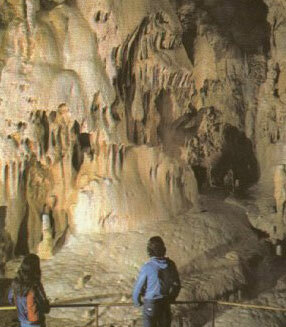 You can follow their traces to Natural Park of Gradistea Muncelului. There are lots of Dacian fortress. 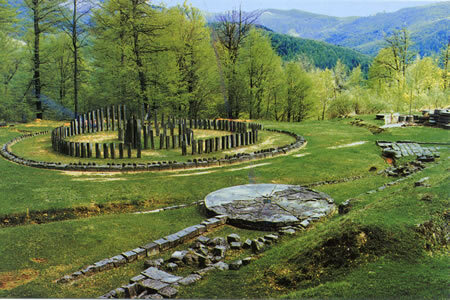 But the best is Sarmizegetusa, political, military, administrative and religious centre of the old Dacia. In the centuries after the Roman Empire collapse Transylvania had a turbulent history. The Hungarian Kingdom, the Ottoman and Austrian Empires occupied this land one after the other. It experienced much conquest and warfare, but also periods of peaceful reconstruction. The outcome was the establishment of a rich pattern of diverse ethnic and religious communities. Buildings are a mosaic of many different styles: Roman, Byzantine, Gothic and Neo-Gothic, Renaissance, Baroque and Rococo. The peasant fortresses and fortified churches (dating even from the 13th century) are the main attractions of the region, seven of them being part of UNESCO world heritage: Biertan, Calnic, Darjiu, Prejmer, Saschiz, Valea Viilor and Viscri. 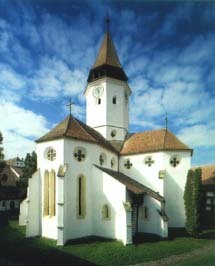 The 200 fortified churches and Saxon fortresses are unique in Europe. Cause you can’t find nowhere else in the world preserved, in such a narrow space, so many reinforced churches and fortress-churches, witnessing medieval defence techniques. Siebenburgen (the Saxon name meaning Seven Boroughs) Brasov, Sibiu, Sighisoara, Bistrita, Medias, Cluj-Napoca, Sebes are the landmark of a remarkable history and civilization. Middle Age it’s almost alive here: murals, towers, bridges, ramparts, narrow streets and squares, fortresses built in the way of the Tartars, Turkish invaders and other plunderers. Transylvania is also known as the legendary realm of Bram Stoker’s Dracula. Hmmm! If you arrived here just for this… If this is your only reason I’m afraid you’ll be disappointed. Why? First of all you won’t find neither Dracula, nor any kind of vampires cause they are simply fiction. The vampire myth exists in Romanian folklore, but it’s quite different from vampire Dracula myth. There are people at the countryside who believe in this myth even today but you’ll find them rather in Oltenia than in Transylvania. Yes, he was born in Sighisoara. But I think this beautiful, unique medieval fortress deserves much more of your attention then the house where Prince Vlad was born. Bran Castle, watching the borders between Transylvania and Wallachia, is just a medieval castle. No connection with Dracula name or character. I advice you to travel to Bran to visit only a castle not Dracula’s castle. Other vice you’ll be very disappointed…Again? People say that Bram Stocker’s model for Count Dracula was Vlad The Impaler. But he was a very cruel reign, not a vampire. Anyway he was a Wallachian prince. So, to find out more about the country he ruled follow the link for Wallachia page. Maramures on territories of Maramures county and Satu Mare county. Here the costumes are best preserved. Every Sunday and holiday you meet people dressed in their traditional costumes. They are also famous for artistic woodcarving, especially their wooden gates and for Merry Cemetery. Crisana on territories of Bihor and Arad counties. Specifics of this area are wickerwork and pottery, red and white folk costumes and their Stroh violin (It’s a violin with a clarion attached). The peasants from Bihor are some of the few people in the world who make and play Stroh violin. Motilor Land on territories of Alba, Bihor and Cluj counties. People make everything that is related to folk art, especially woodcarving (the practical side, almost any object needed in a house that could be made of wood) and red pottery. They are famous for a women alpenhorn player group. Somes area on territories of Cluj and Salaj counties. The villages preserve unchanged, for many centuries, interesting customs and traditions: folk art, wooden gates, folk costumes, wicker works, sheepskin and leather works. Bistrita area on territories of Bistrita county. Bistrita people use dazzling colours in their folk costumes, decorated with peacock feathers. Famous for their dance “Calusul” and their plum brandy. Mures and Tarnave Valleys on territories of Mures, Alba and Sibiu counties. A very rich and divers area. The confluence of some ethno folkloric important subareas – Superios Mures, Gurghiu Valley, Tarnave Valley – and the colour resulted from the Romanian, Hungarian, German and Gypsy people mixture who live together on this lands make this region very special. Marginimea Sibiului and Fagaras land on territories of Sibiu county. Here you can participate to customs related to shepherds’ life. You can also taste their homemade “cas”, a very tasty fresh cheese. Ciuc area on territories of Harghita and Covasna counties. Hungarian traditions are dominant in this area. They are famous for painted furniture as well as Corund village wickerwork and pottery. Banat on territories of Timis and Caransebes counties. Here you’ll find a mixture of many and different traditions: Hungarian, German, Serbian, Czech, Slovakian, Bulgarian, Ukrainian beside Romanian, of course. Hategului Land on territories of Hunedoara county. People of this land keep the customs alive since Dacians times. Orastie is a well known centre of sheepskin and leather works. Barsei Land on territories of Brasov county. This area shows you a powerful urban character. Brasov, well known commercial and craftworks citadel even from earlier Middle Age, puts its stamp on regional traditions.